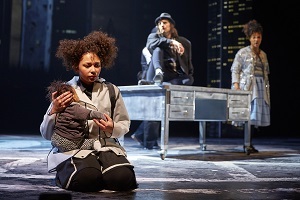 “Wonder.land” is a new musical experiment that transposes the story of “Alice in Wonderland”, and “Alice Through the Looking Glass”, into a contemporary urban London setting amidst the world of technology. The show has music by Damon Albarn (of Blur & Gorillaz fame) and is written by Moira Buffini (who also did the very successful, “Handbagged”). This work is directed by Rufus Norris, the director of the National Theatre who was also “Behind the Beautiful Forevers”. The trio are all the co-creators of the show, which had its world premiere at the Manchester International Festival (which ran from July 2-19) and it was reworked before it opened at the National on the November 23 and runs in rep at the Olivier until April 30, 2016. It’s a really bold idea to update a children’s favourite book for an online generation and it works well in parts. The visual projects by 59 Productions, a creative studio that specialise in design for performance and live events, are a treat and the set design by Rae Smith is something to truly admire. (Some of the stuff looks like liquorice all sorts in terms of the colours and even the grey tones signifying Alice’s drab existence are very sophisticated). The show begins with a Liberace type character arriving on a small car talking about having a digital portal to boundless lands, swiping a screen and surveying his domain and he is the narrator who introduces us to the computer game before we meet Alice. Alice – now called, Aly (played by Lois Chimimba) is a stroppy mixed race teenager who is being neglected by her mum, Bianca (Golda Rosheuvel) because she has a new baby and is in a trial separation from her husband, Matt (Paul Hilton). Poor old Alice and her mum have a hard time communicating, so she stays in her room and plays with her phone, where she is trolled by the version of The Ugly Sisters. Soon, Alice is enticed into joining a computer game and creating an avatar for herself, who is all #Girlpower and #ThisGirlcan type hashtag – despite being a blonde Barbie Bombshell with blue eyes! Interesting that a mixed race child with an Afro picks a blond avatar, and you wonder if there is a subtle statement coming out here by the creators, but the audience is soon swept away by the technology, visual effects and live animation on the stage – there is really no time to ponder on the sociology. Special mention must go to the especially loved Cheshire cat sequence, as well as of the girls’ computer avatars. At school, Alice is befriended by Luke Laprel (Enyi Okoronkwo) who is also into computers and when her teacher (a cross between The Queen and The Duchess of the original) steals her phone for using it in class – the teacher creates another avatar of Alice and is destructive, to say the least. There are some dark moments, especially in the school bullies scene. The song and music sequences are not really memorable, and this is more a play with songs – but the visuals, set, and second act is really fascinating to watch, and since it is a Christmas show, we can expect a happyish ending! There are moments of real honesty and emotion in the relationship between the mum and the teenager (and many mums with teenage children will be able to relate to the dialogue or lack of it)! Audiences will recognise the many characters from the “Alice in Wonderland” books and even if you have never read them there is much to enjoy in this transposition which runs until April. Age guidance -‘wonder.land’ explores teenage issues and contains some strong language. It’s not suitable for children under 10. ‘Wonder.land’ by Damon Albarn, Moira Buffini and Rufus Norris at the National Theatre, South Bank, London, SE1 9PX, 2pm/2.30pm matinees and 7.30pm, until April 30.